Although 2008 marks the 70th "birthday" of Superman, it's also the fiftieth anniversary of The Fortress of Solitude, his legendary arctic hideaway that made its first appearance in Action Comics #241, 1958 (click on the cover image for a larger view). With cover dates typically three months ahead of the actual sale date, issue #241's June cover date means it most likely hit the newsstand in March or April of 1958...in other words, right about now! To celebrate this momentous milestone, I thought I'd devote an entire week's worth of Comic Coverage blather to Superman's secret sanctum. For the first 20 years of Superman's history, various private laboratories and secret citadels were mentioned, but never formalized with a consistent look, location, or even an official name. 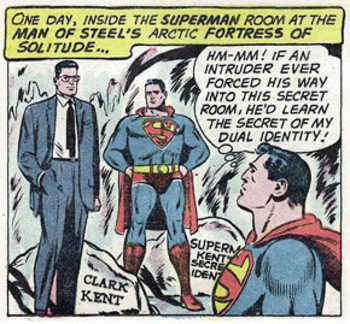 However, a story in Superman #58 (1949) mentions both a location in the "polar wastes" and the first use of the name "Fortress of Solitude". 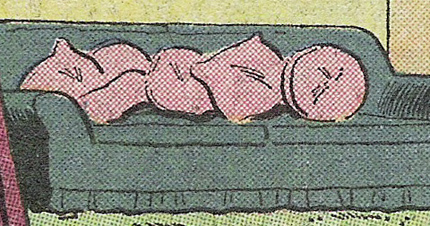 Well, at least its first use within the Superman mythos. The term itself actually goes much further back to an old pulp (pre-superhero) character named Doc Savage, who also had a Fortress of Solitude located in the arctic. 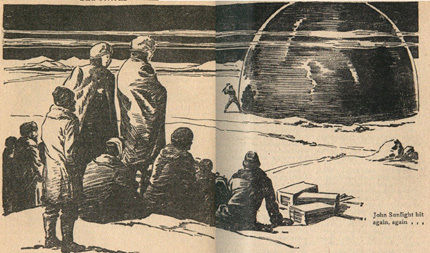 The blue-domed arctic sanctuary of Doc Savage is discovered by the evil John Sunlight in the story The Fortress of Solitide (published in 1938). "All kinds of things" indeed! Be sure to tune in for all kinds of Fortress facts...and maybe even a secret or two! Coming up tomorrow: Key information on the most famous feature of the classic Fortress of Solitude! 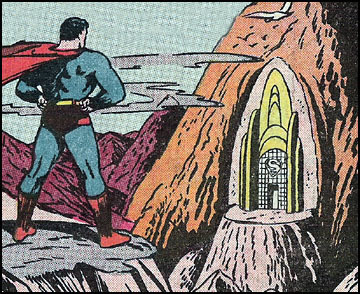 As with any tour of a famous home or historic building, the best place to start my week-long tour of Superman's Fortress of Solitude is right at the front door, arguably the coolest (and most famous) front door in all of fiction. As literally the first image of Superman I can recall seeing as a boy (which I detail here), the cover of Superman #187 (1966) combined every kid's fascination with secret clubhouses and the visual novelty of "huge stuff" into a powerful image that made me an instant convert to the fantastic world of Superman (and superhero comics in general). So, with that kind of life-altering impact, how can I not devote an entire post to that famous front stoop? 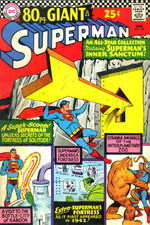 Oddly enough, the very first appearance of the golden key on the cover of Action Comics #241 (1958) looks nothing like its more robust (and familiar) appearance on page two of the story inside, making it clear that miscommunication between editors and creators has at least 50 years of history as well. the cover vs. the more familiar image on page 2. 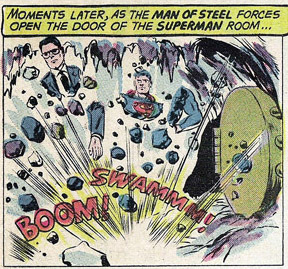 Did you happen to catch Superman's rationale for leaving the giant key in the open snowfields, as opposed to hiding it somewhere (perhaps under a giant welcome mat)? 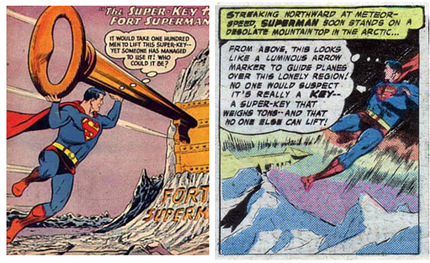 According to Superman (who, keep in mind, was portrayed as an unparalleled super-genius at the time), his big shiny key would serve as an "arrow marker to guide planes over this lonely region"...as if giant golden arrows were a common directional indicator or pilots wouldn't be the least bit curious or suspicious of such an unusual object. There's a reason his name is "Superman". Yeah, well, besides the fact that he's got several dozen impressive super powers, I think part of the whole "super" thing is his clear and well-documented love of doing things in a BIG way. 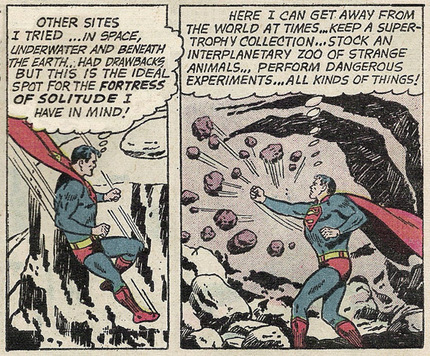 In other words, there's our modest, regular-guy way of doing things, and then there's the SUPERMAN way of doing things...as I'll demonstrate in a quick stroll through his Fortress of Solitude. 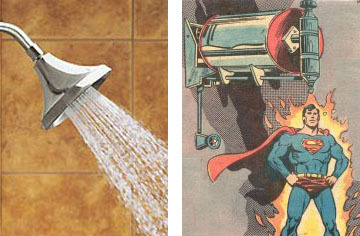 For example, we enjoy warm showers...while Superman enjoys the white-hot cleansing power of his super blowtorch, located just inside the Fortress door. Regular people sometimes keep a discreet diary or journal. Superman keeps a giant diary with metal pages he inscribes with either his heat vision or his fingernails! We've got the electric paper shredder. Superman? An atomic disintegrator pit. 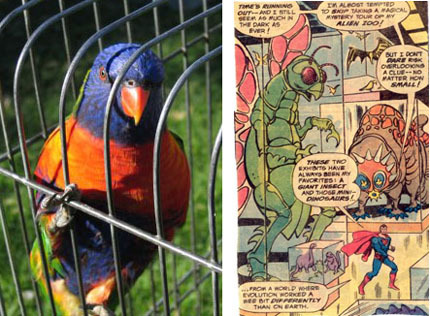 Just as regular people keep small animals captive in confining cages, Superman keeps the huge creatures of his Interplanetary Zoo stuffed like sardines in plexi-glass cages with no room to turn around or visible form of nourishment. 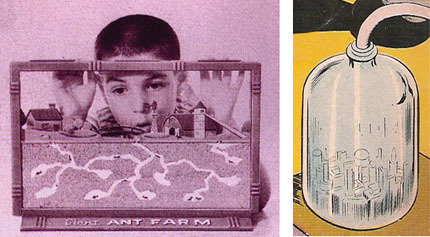 As kids, we gazed in wonder at the complex mini-societies of ant farms....which Superman easily tops with Kandor, an entire Kryptonian society shrunken and imprisoned within a glass bottle by the evil Brainiac. Finally, the average person proudly displays a photo or two of their parents, right? 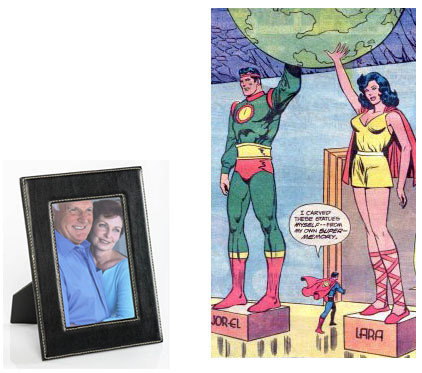 Ah, but when you're Superman, you proudly display lifelike 30 ft. statues of your parents holding your birthworld aloft. 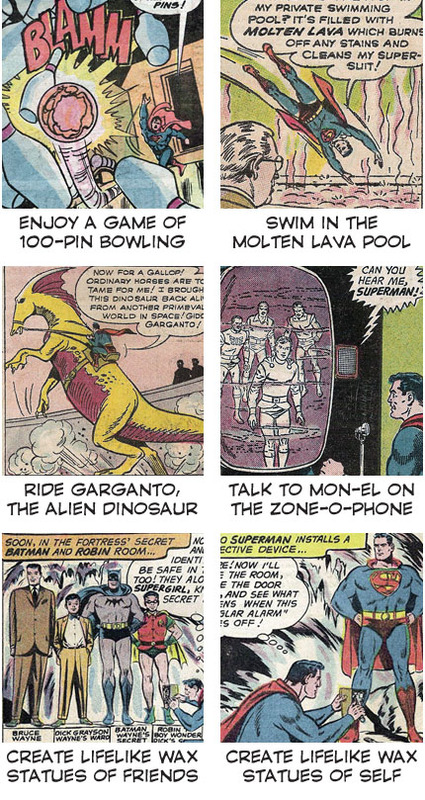 Part of Superman's motivation in building the Fortress of Solitude was for it to be a temporary refuge from his enormous responsibilities....where he could engage in various hobbies and activities free from the demands of his frantic schedule. In short, it was a place for him to enjoy a little "me time" (as our Oprah-fied society might put it). So...what did he do when he visited that icy clubhouse of his? simulation of his native world exploding over and over and over again. The Fortress at 50: Loyal Friend or Creepy Stalker? As you've seen over the past several days, the Fortress of Solitude is a pretty amazing place. With its immense scale and unique exhibits, Superman's arctic hideaway exemplifies all the greatness and nobility of comics' original superhero. Er....except for the Friendship Exhibit wing, which reveals some astonishingly bizarre and disturbing aspects of the Man of Steel...or in this case: The Stalker of Steel! Sure, much of the strangeness of the Friendship Exhibit panels can be attributed to the slam-bang pacing of 50's and 60's comic books, where any attempt at poignancy or emotional shading was usually steamrolled by the frantic 8-page story format. So, instead of providing deep insight into the hero's human friendships, the "emotional shorthand" of that era's comics made Superman's Friendship Exhibits come across as a little nutty or (at times) deeply insane. 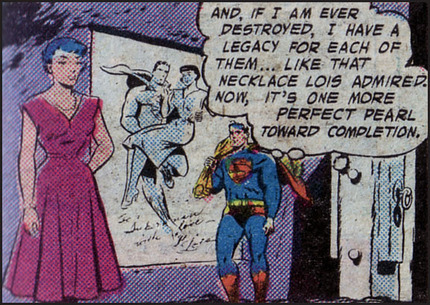 Case in point: Not only did Superman make wax statues of his costumed friends (Batman and Robin) and family (Supergirl), but he also stuck statues of their secret identities right next to them...complete with handy labels (a common compulsion of the Silver Age Superman Family). Why would Superman, whose powers included a perfect memory, need a physical reminder of what his friends looked like and what their real names were? Even if you allow for the occasional memory gap, ever hear of "photo albums"? Also...think about it: a secret fort filled with a small army of mannequins that look like your friends and family...that you made and dressed yourself. Worrisome. Anything crazier than making wax dummies of your loved ones? and then putting them in a room dedicated to yourself. Oh, yeah...in case you're wondering why Superman was fiddling with circuit boards on the Batman, Robin, and Supergirl statues, he was rigging all of the statues (including his own) to instantly explode when an intruder entered the Fortress of Solitude. Shrewd...or stone-cold crazy? You be the judge! When he wasn't booby-trapping wax statues of his loved ones, Superman was creating elaborate rooms (or, more accurately, "shrines") dedicated to his closest friends. Although it's hard to get any crazier than a pot-bellied Perry White dressed in a superhero costume and brandishing a Kryptonite sword to attack a lead-encased Superman, take a closer look at the tiny house in the background. That's right...a tiny scale model of Perry White's home! 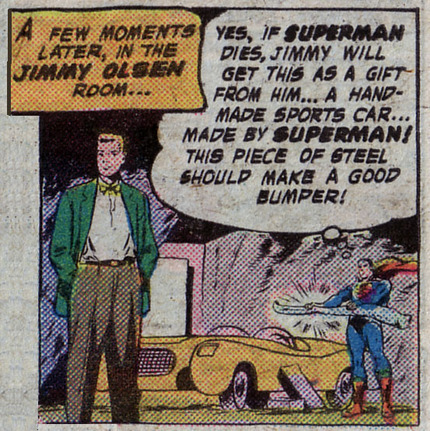 It's bad enough Superman has a room dedicated to his boss, but taking the time to build a tiny replica of his home? Stark. Raving. Mad. 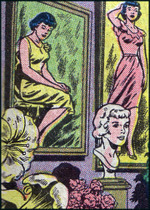 Naturally, Superman's girlfriend Lois Lane also received her own Friendship Exhibit room...though I'd imagine more than a few women might be creeped out by a room plastered with paintings, photos, and busts of their image. For the handful of you ladies unruffled by such a spectacle, how about beholding a lock of your hair under glass? Finally, a Robot Detective was ready to make Batman's life alot easier upon Superman's death. But...if he's such a great friend, and defeating crime is Batman's driving mission, why wouldn't Superman give the contraption to him right now? Of course, it's a little silly to expect logic from such an obviously addled mind. As great as the Fortress of Solitude is, perhaps too much solitude can make you a little crazy. The hair-collecting, model-house-building, exploding-wax dummy kind of crazy. The Fortress at 50: "This Special Wing"
A snazzy space-age table lamp? A tasteful green sofa with pink throw pillows? Posters of clean-cut teenage boys? By this point, you're probably getting a little concerned about Superman and his "special wing"...but rest assured, this trendy early 60's room didn't belong to Superman, but to his teenage cousin Supergirl! Leading a low profile as "Superman's secret weapon" for her first few years on Earth, cousin Kal-El finally revealed Supergirl to the world in Action Comics #285 (1962). Following a day of overwhelming public adulation, Superman surprised Kara Zor-El with her own special wing of the Fortress of Solitude! Sure, you could quibble on why Superman waited years before he allowed Supergirl to have her own tiny section of his Fortress, but considering the primary demographic of Action Comics at the time (i.e. teeming hordes of pre-teen boys), admitting a girl into what was essentially the ultimate "boys' clubhouse" was a big step that just couldn't be rushed into. 1. 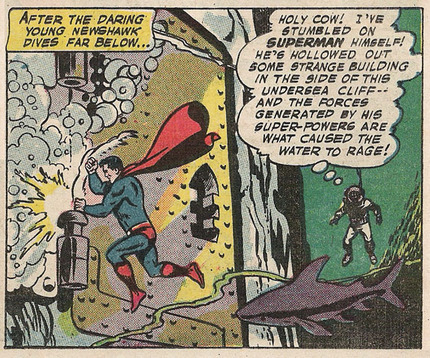 The Secret Citadel: Superman's first "home away from home" appeared in Superman #17 (1942). With "hands flying like piston rods", Superman carved his first fortress into a mountain range somewhere near Metropolis. I've always loved its Art Deco design and the huge S-emblem of that magnificent entry way. The Secret Citadel was later designated as the Fortress of the so-called "Earth-2 Superman", an alternate version of Superman who's history mirrored the earliest Superman stories. Note: Before and after the Secret Citadel's handful of appearances, there were also mentions of vague locations such as Clark Kent's "laboratory" (Action Comics #32, 1941) and Superman's "hidden laboratory" (World's Finest #11, 1943), which may or may not have been part of the Secret Citadel. 2. 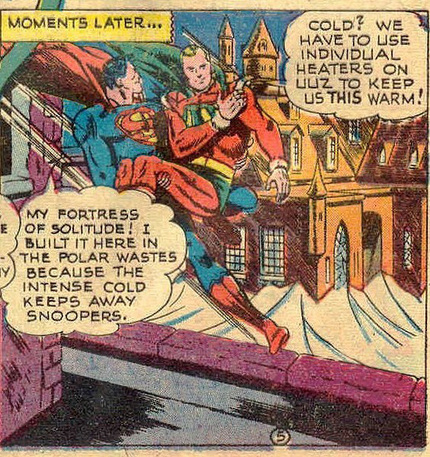 The "Polar Wastes" Fortress of Solitude: The term "Fortress of Solitude" and an Arctic location are mentioned for the first time in Superman #58 (1949), which depicts a castle-like structure encased in ice...looking more like Santa's North Pole workshop than the Fortress we're all familiar with. A hearty "thank you" to a fellow Superman fan for locating this hard-to-find panel for me! I saw it for the first time only a few days ago! 3. The Fortress of Solitude: Nine years after its proto-appearance in Superman #58, Action Comics #241 (1958) saw the official debut the classic Fortress of Solitude, an enduring favorite of many (including yours truly). This version enjoyed a whopping 28 year run (the longest of any Fortress) before DC packed it away in 1986 (more on that later). Check out some of my previous posts for more information on this version. 4. The Undersea Fortress: A few months later in Action Comics #244, Superman created an undersea version of his Fortress of Solitude, later ceding it to the people of Atlantis for their use. Note the repetition of the "golden door with giant key hole" motif. 6. 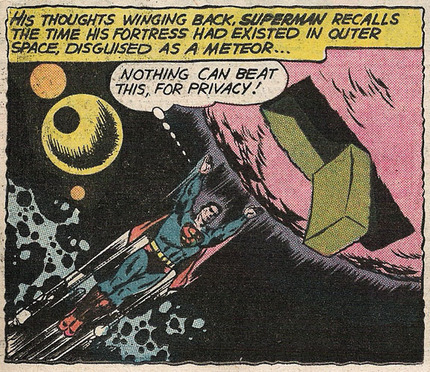 The Center of the Earth Fortress: When Superman's Outer Space Fortress didn't work out (after being attacked by an evil space entity), he relocated the hollowed out meteor to the molten center of planet Earth. His stay was short-lived after he was attacked by a race of hostile fire people.